Lillian Gish and Richard Barthelmess in Broken Blossoms. Yellowface. It’s the still-common practice of a white actor portraying an Asian character in film, in both lead and supporting roles. The practice extends at least back to Mary Pickford playing Cio-Cio San in Madame Butterfly in 1915, and the controversy extends to such recent releases as The Last Airbender, Cloud Atlas, and Ghost in the Shell. It relates to blackface performance, as well as “redface” (whites playing Native Americans), whitewashing, racebending, and other terms much alive in media debate today. Meanwhile, playing an Asian character was deemed to be a challenging bit of “stunt” acting, a transformation akin to the impressive body-morphing performances of Robert De Niro in Raging Bull and Christian Bale in The Machinist. An Asian performer could not be expected to expected to delineate the subtleties of an Asian character (??? ), therefore a nice bankable white person could wrap the mysterious, evocative, and utterly stereotyped Oriental Otherness about themselves, while still shining out and signaling their whiteness beneath. Cognitive dissonance, but it made the filmmakers money. At any rate, young white actor Richard Barthelmess was tapped for the role, and it made him a star — he went on, ironically, to be silent film’s emblematic leading man, the fresh-faced, naïve but determined hero in films such as Way Down East (1920) and Tol’able David (1921). As Barthelmess aged, he made the jump to sound with little difficulty, but less impact, headlining the intriguing and dark Heroes for Sale (1933), then moving into excellent work in supporting roles such as Only Angels Have Wings (1939) and the 1942 version of famous Western slugfest The Spoilers. As Cheng Huan, known more popularly as “the Yellow Man” in the intertitles (the original story by Thomas Burke from his Limehouse Nights  was titled “The Chink and the Child”) Barthelmess emotes through a facial mask of imposed passivity, accentuated by the Asian makeup he’s wearing. Cheng Huan came to England eager to teach the ways of the Buddha, but slumps into opium-fueled lethargy as a common shop owner. The story is a typical melodrama, intimate in scale in contrast to D.W. Griffith's mammoth productions Birth of a Nation and Intolerance. It's set in the poverty- and crime-stricken confines of London East End district Limehouse, also home to fictional opium dens, white slavers, and Sax Rohmer’s criminal mastermind Fu Manchu. There is an abused child-woman, played to perfection by Lillian Gish. Her character Lucy is given the age of 15, but as played by Gish she’s more of an addled 8-year-old, definitely prepubescent. Her wan, droopy helplessness is disturbing, especially the much-lauded gesture of her repeatedly forcing a smile onto her face. She only really comes to life when her father’s about to kill her, and she bashes about the inside of a small closet in hysterics. She is the hapless punching bag of her father, the drunken boxer Battling Burrows, played by none other than — oh my God! is that Donald Crisp? You may remember him solely as the gruff but saintly patriarch in films such as How Green Was My Valley (1941) and National Velvet (1944), but he started off playing baddies, and he is a real stinker here. He drinks, he grimaces, he pantomimes terribly. 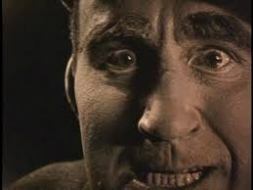 Griffith intimidates the viewer with extreme closeup -- here, Donald Crisp in Broken Blossoms. One day, a badly beaten Lucy collapses in Cheng Huan’s shop, and he takes her in, caring for her and lavishing her with attention. Here the taboo of miscegenation raises its ugly head. Miscegenation, for those of you who don’t know, is the belief that people of different races shouldn’t love, physically or otherwise, formerly enshrined in law in many places, including the U.S. Cheng Huan can’t be shown relating sexually to a white woman, especially a 15-year-old. So he idolizes and spoils her, keeping their relationship on an infantile, asexual level. (At one point she asks, “Why are you so good to me, Chinky?” Ouch.) It is this sexless nobility that elevates Cheng Huan, oddly making him the most Christian of characters. Of course, their idyll cannot last, and the inevitable happens. Griffith is doing what all the great film moralizers do — he outlines the abuse and retribution, while bemoaning same. Women and minorities have no chance in Western society in the world of Broken Blossoms, but Griffith pleads for them anyway, no matter how awkward or condescending he may be. The NFR Project is one writer’s attempt to review all the films listed in the National Film Registry, in chronological order. Next time: The Dragon Painter.